We all see the massive benefits of “Virtual Assisted Living” –emotional and financial. Independa and DDSTUDIO are helping the sandwich generation; supporting independence in the over 80’s. Boomers, their parents, and their children would rather be living their own separate lives, coming together to enjoy each other at family events. San Diego startup Independa offers relief from the stress and costs of moving your parents into your home or a nursing home. 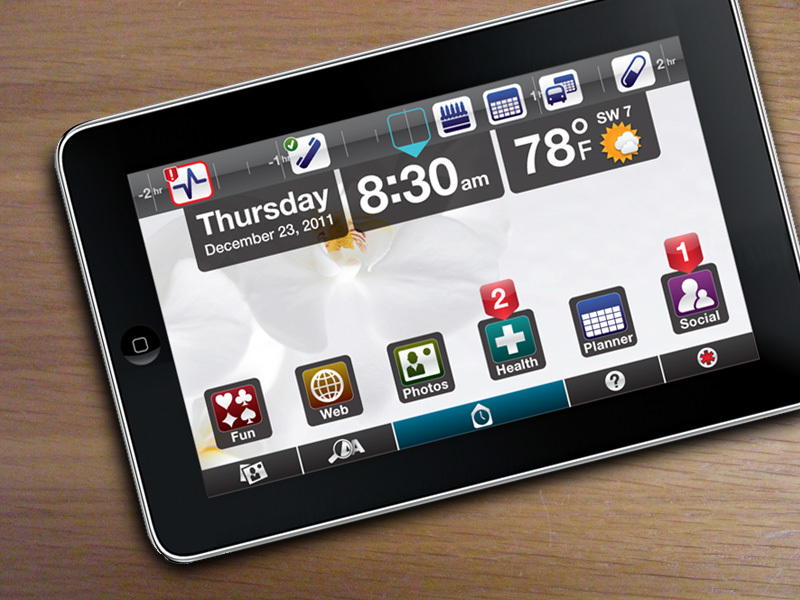 DDSTUDIO assisted Independa in creating the Angela tablet interface, a way to take care of your loved ones by keeping them connected through virtual assisted living. DDSTUDIO collaborated with Independa on Angela’s GUI and visual brand language, carefully researching how to make Angela an integrated tool in the user’s daily life. Our biggest challenge was getting into the mindset of an 80-year-old person—cautious of technology and struggling with deteriorating sight, yet still active and independent. At the same time, we recognized that Angela would be two separate platforms: one for the tech-savvy caregiver and another for the aging parent, and developed a separate platform for the cargiver to manage their parents life. The caregiver web app is an all-encompassing programming site, which is paired with a simplified version for the care receiver. Together, they are a lifeline that connects your independent parent to you and your whole family through enjoyable activities. We wanted to help organize daily life with one simple tool. 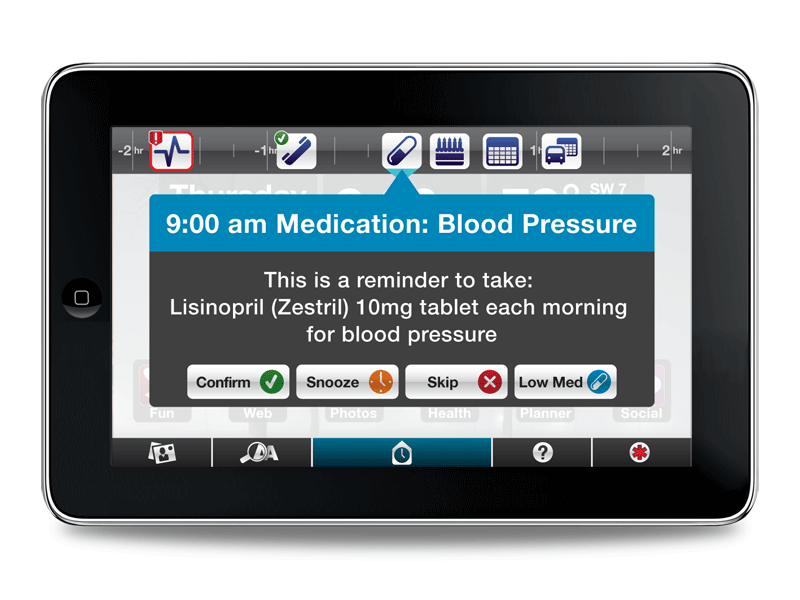 Games, social media, photo albums, and medicine reminders are laid out on a user-friendly screen. The header is a continuous timeline with reminders for social engagements, medicine, family time and appointments. Angela encourages your loved one to join social networks, video-conference with their grandchildren, or keep sharp with Sudoku. When an action is acknowledged by the care receiver, such as a medical appointment, the caregiver gets a text message that the action has been completed—ensuring peace of mind. A special feature is capturing life stories that bring back great memories enriching their family’s lives. With a fresh idea, a creative approach to providing eldercare, and EvoNexus support; Independa positioned themselves as a leader in the nascent aging-in-place market. Now fully funded and immensely successful, Independa announced at International CES 2012 that they have partnered with LG to bring the Angela interface to LG’s Pro:Centric enabled televisions as a health and social engagement platform for senior consumers. DDSTUDIO contributed to initial research, experience design, storyboarding, wire framing, visual brand language, graphic concepts, use feedback loops, and prototype development.